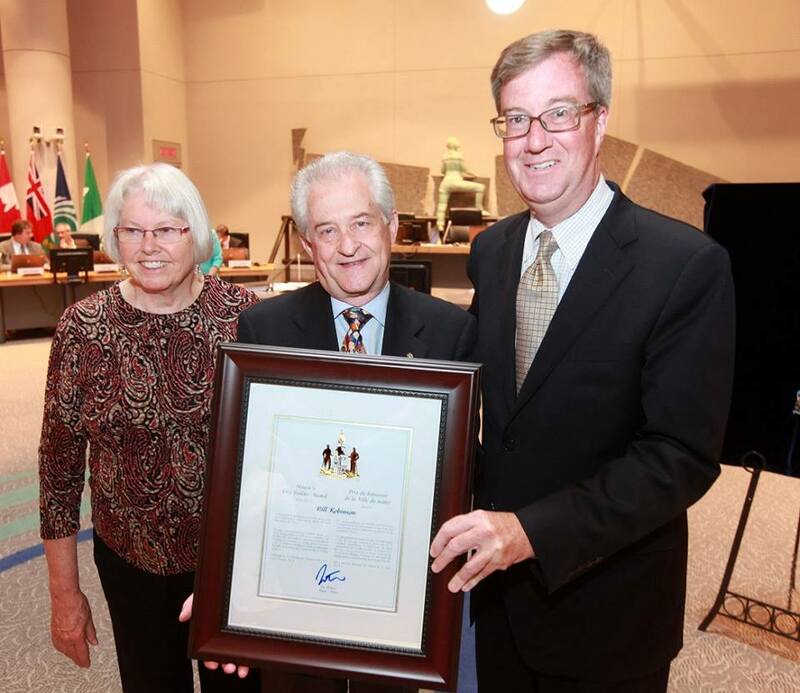 Mayor Jim Watson and Councillor Marianne Wilkinson presented the Mayor’s City Builder Award to Bill Robinson today, recognising his devotion to improving the lives of at-risk children and youth, and new Canadians, over the past 30 years. Mr. Robinson’s countless hours of volunteer work with the Michelle Heights Community House, the Pinecrest Queensway Community Health Centre, the Dave Smith Treatment Facility, Volunteer Ottawa, Rotary District 7040 and the Rotary Club of Nepean-Kanata have made a difference in the lives of new immigrants and the most vulnerable young people in our community. His focus in much of his volunteer work has been on promoting success in school and helping to provide the building blocks to secure job experience and build successful careers. As a Rotarian, he has worked on many community-service initiatives that have had a direct positive impact on Ottawa residents. He is currently a board member of the Ottawa Rotary Home, a respite care home for children and adults with complex disabilities. For the Caring and Sharing Exchange, he organizes the delivery of more than 300 Christmas hampers every December.